KeyesFax is a full function automated fax system for the IBM i. It combines both a send and receive facsimile processing system with a complete image package plus a highly flexible information manager that can be used as a phonebook. The image and fax software will edit, send, receive, display, print, and track Fax documents or images using any standard IBM i (i5, iSeries, AS/400) without additional expensive hardware or software. Up to twenty-four telephone lines may be attached. Each requires a Class 1 fax modem, which typically runs less than $100, attached to an IBM i communications port. Any of the Integrated Modems on an IBM i may also be used for faxing. Documents may be IBM i spooled files, IBM i source files, a variety of bitmapped image types, or anything that a PC can print from any application. KeyesFax supports any type of PC with any operating system that has a web browser, for creating and displaying Fax documents. Images such as logos, signatures, or forms overlays may be gathered in a variety of ways: You may use your fax machine as a scanner by faxing images directly to your IBM i. You can upload images from a PC or scanner. You can even develop forms using any third party forms design software. We provide all the tools necessary for you to easily upload and convert other image types to Fax images. KeyesFax is a full function automated fax system that bundles three packages into a single, simple to install, easy to use, powerful yet inexpensive system. It combines both a send and receive facsimile processing system with a complete image package plus a highly flexible information manager that you can use as a phonebook. Our fax software will edit, send, receive, display, print, and track Fax documents or images using any standard IBM i (i5, iSeries, AS/400) without additional expensive hardware or software. The only extra hardware cost involved is for a Class 1 fax modem. These are usually available from any PC store for about $100. Any Integrated Modem on the iSeries is also supported. All you need to display images is any PC running any operating system with a web browser. Images such as logos, signatures, or forms overlays may be gathered in a variety of ways: You may use your fax machine as a scanner by faxing images directly to your IBM i. You can develop forms using any third party forms design software or using any graphical software on a PC. We provide all the tools necessary for you to easily upload and convert other image types into Fax images or forms overlays. KeyesFax uses an inexpensive fax modem attached to your (usually preexisting) V.24 communications port to send and receive Fax documents. It also supports any of the Integrated Modems. Documents can be prepared and faxed from any terminal or application on your iSeries. Outbound faxing is quite versatile. There are a number of different methods of producing fax documents. You can fax spool files, source files, images, or quick messages from any terminal using a Message Editor that we supply. The system will automatically convert and merge together the desired text and images. The fax can be sent right away, scheduled for off-hours, consolidated with other faxes, or sent to multiple destinations using easily maintained phone number lists or distribution lists. You can fax documents from your PC through the iSeries. Our HTTP Server allows any type of PC with a web browser, to create, send, and control faxes. The server quickly converts PC documents or images into a fax, adds an optional customizable coversheet, and uploads it to the iSeries for faxing. It can also convert any graphical document into a forms overlay. The system includes an advanced text editor that allows you to easily create quick fax messages or coversheets that can include your company logo from any IBM i terminal. The Message Editor includes word wrapping, copy, insert, delete, and even spell checking. We pull documents right out of your spool file, and can merge them with other images such as logos or forms overlays. You can type out a quick message on an optional coversheet, then you are returned back to your application while the fax is being processed. You can fax a document to a list of phone numbers and even e-mail addresses. Each fax can be personalized, through the use of substitutable parameters stored in a phone list file. You can send individual pages of a multi-page document to separate destinations, where the phone numbers or e-mail addresses are extracted from information found in the document itself. This is often used for faxing invoices, acknowledgements, purchase orders, etc. The system merges your spooled files with any desired forms overlays, looks up the recipients in master files, and faxes or e-mails each page to the appropriate destination. An output queue (FAXCOM) is provided to make faxing spooled files very easy. Any spooled file placed in this queue is automatically picked up and faxed. Users can easily track their own faxes using a Fax Queue. They can change fax parameters, such as the phone number, priority, or scheduled time, place a fax on hold, restart a fax or even e-mail a fax. Inbound fax documents are brought into a Receive Queue on the IBM i. The received faxes can be quickly copied, routed, refaxed, viewed, downloaded, or printed on any HP compatible laser printer attached to the IBM i or to a PC. Notes may be added to each received page that can be read or appended by anyone viewing the fax. In addition, the faxes can be easily e-mailed to user's desktops with our optional KeyesMail module. KeyesFax on the IBM i is actually more practical than PC-based fax systems. Unlike a PC, the IBM i can send and receive fax documents in the background with no degradation of foreground performance, a common complaint amongst PC fax users. Also, there is very little concern about uptime on an IBM i compared to a PC. KeyesFax has won an award for being the most reliable fax system for the IBM i. Faxes received on the IBM i are instantly available to all its workstations and printers. You get all the advantages of a true multi-tasking system, without the headaches of a PC network. Your fax machine becomes a handy image scanner for letterhead, logos, signatures, drawings, forms, photos, price sheets, etc. Using our editing programs, you will be able to cut and paste the desired parts into images that you can merge with your fax messages. To use a fax machine as a scanner, you would simply dial the IBM i's phone number and send it a fax. Images may be displayed on PC's using a web browser, with our HTTP Server. The system will allow you to convert and upload many different types of images to the IBM i. Image documents are converted to one of three different types: PCX, TIFF, or FAX. PCX and TIFF images are the most common images that PC graphics applications, scanners, and fax programs use. You can transfer either of these types to the iSeries in their original ASCII format, convert them to forms overlays or include them with your faxes. KeyesFax is so simple to use, that it's fun and productive. Searching, editing, routing, viewing or faxing images, security; every feature of KeyesFax is performed in a consistent, easy to understand manner. Any IBM i workstation operator will be able to effectively use our programs after they spend just a little time going through the quick hands-on tutorial. KeyesFax contains a complete set of position sensitive Help screens to assist you in using the programs. An information manager, called KeyesFile(tm), utilizes the power of the IBM i Data Base to build a set of index cards that instantly sorts itself in a thousand different ways. You can use it to keep track of a wide variety of information, such as: names and addresses, phone numbers, sales information, calendars, contact management, customer follow-up or call-back information, itineraries, image documents, fax messages, or anything else that you would like to have quick access to. It can be used to index, store, display, or fax documents using single keystrokes. KeyesFile works by entering information on cards, with up to a thousand lines per card, a million cards per file, and an unlimited number of files. KeyesFile can store rigidly structured data or free form information such as notes and comments both on the same cards. You can organize any data the way you want it, on the fly, with no programming, and no training. 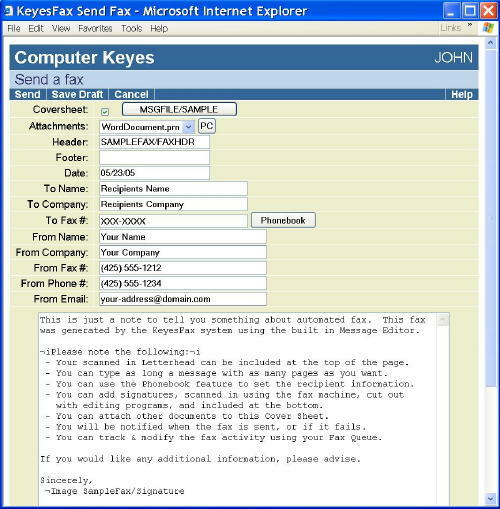 KeyesFile can be used as a fax phone book for the Message Editor and to quickly create phone lists for broadcast faxing. The true power of KeyesFile is its instant accessibility of the cards using any piece of information that you have entered on them. Cards are instantly displayed in alphabetical order, re-sorted on any of the cards' lines with the touch of a key. For example, assume you recorded information about your customers with company name, address, contact, phone number, and sales activity. You could access the cards by company name one moment, then by contact, city, or phone number the next, or by any other information that you have placed on any of the available thousand lines of each card. We have included a number of API's in the system so that you can easily integrate Fax or Image programs with your existing software. Below is a list of some of the commands that your applications can call. This program is used to display any PCX, FAX, or TIFF image on the IBM i. This program calls a text editor that is used to create quick fax messages or coversheets with your company logo on any IBM i terminal. Your application can pass all of the recipient and sender information needed to prefill a complete fax including a standard message to reduce or eliminate the operator workload. This can be used to convert any spooled file to a FAX image with an optional forms overlay, attach an optional coversheet, and fax it to one or more destinations. This can be used to convert and fax any text or image document, with an optional coversheet. We have included two output queues for automatically faxing documents. One faxes all the time, the other only faxes during night hours that you can set. Spooled files are automatically burst, merged and processed from these queues. Using a spooled file definition program, you can direct exactly how you wish each spooled file to be processed. You can even code Exit programs to retrieve fax numbers from your master files. The software takes only minutes to load onto your system. The external fax modem plugs directly into an IBM i communications port, and an install program creates all of the necessary communication objects in our library while the computer continues its regular duties. You should be able to start transmitting faxes within a couple of hours after receiving the package. The first year of maintenance is free. Thereafter, an annual maintenance fee of 20% of the current price will keep your system current and bug free. Download to a PC and double click, then view the included Readme.txt. To try KeyesFax free for 30 days, use the link below to download the software to a PC and then double click to extract a Readme.txt with further instructions. Contact us or use the form below to have an activation code sent to your email. Incorrect Image Verification answer, or the server encountered an error. KeyesFax can handle up to 24 fax lines on one system. Although KeyesFax software requires a fax modem connected to a telephone line to send faxes, our email product (KeyesMail) might be what you are looking for. Email uses a network line to send email, and email can be sent to various online services that will forward it along to your customer as a fax, without incurring any long distance charges. Most of our customers use a US Robotics external modem for their faxing. KeyesFax works on any of the IBM Internal modems as well. 1) Use GO HARDWARE to view an IBM menu. 2) Select option 1 (Communication Resources). If you wish to use an Internal modem you must change the "Modem initialization string" in the Fax Setup to "AT&S0". If you do not know how to configure it, you may call us at (800) 356-0203 for assistance. If you purchase a US Robotics modem, it is recommended that you recreate the fax line using CRTFAXCOM, and specify Hardware Flow Control. Then change the "Modem initialization string" in the Fax Setup to blank or ' '. The modem class must be set to 1 for certain IBM integrated fax modems such as the 2793 and 576C, but most others can use either 1 or an A. 1) If you are calling an API, such as KSNDFAX, to send a fax: Just set the Fax Priority parameter to a value smaller than the default priority of 5. Smaller numbers are higher priority. 2) If you are sending a spooled file through the FAXCOM output queue for automated faxing: Just set the Printing Priority of the spooled file to a value smaller than the default of 5. KeyesFax will use the Print priority for the Fax priority. Go into the setup for either one of your fax lines (line 1 or 2). Set the "Outbound fax line" parameter to an "N" - temporarily. After the current fax is finished sending, the fax line will not start another fax. You can now go to your fax machine and send a fax to that fax line. Yes, both KeyesMail and KeyesPDF can generate a Duplex PDF document with the help of KeyesOverlay. KeyesOverlay will add the overlay for the Invoice. It will also add the Duplex image to the backside. The PDF can be e-mailed and this will not negate the Duplex document. The recipient will be able to print it in a duplex manner - assuming their printer has this capability or as two pages if not. KeyesFax can only send multiple pages - it cannot force a fax machine to print on the back side, so it does negate the duplex printing. But, you can still send an image to be included as the duplex part of the fax. You would just have to save the backside image as an Image and use a ¬Image command to include it with the fax. Question #1 - Is there a maximum number of fax lines that can be defined in KeyesFax? Question #2 - Can the KeyesFax software be configured to use a network line to fax instead of a card/modem? Question #3 - What brand of modem do you recommend for working with KeyesFax? Question #4 - What IBM internal modems are supported in KeyesFax and what Flow control and initialization string is best to use in the line setup? Question #5 - How do you increase the priority of a fax? Question #6 - Both of my fax lines are busy sending faxes, but I need to fax a document into the system in order for it to then fax out. What do I do? Question #7 - Can I create a duplex document with your software? *SCS printer files can be processed in increments of 999 pages using the "Page Range to Print" spooled file attributes. Set the "Starting Page" and the "Ending Page" values and you can process the same spooled file multiple times. The KeyesFax.ImageMaker print driver has been enhanced to include Windows 10. KeyesFax has been enhanced so that you can connect an Ethernet Device Server, such as a Digi PortServer, to an Ethernet line to be used for Faxing. The PortServer is configured and connected to an External Modem, which has faxing capability, and this is connected to a phone line. This configuration no longer requires I/O ports on the IBM i for sending faxes. KeyesFax has been enhanced so that it can use modems that support Service Class 2.1. Class 2.1 is designed to allow fax communication at V.34 speeds up to 33,600 bits per second (bps). Many modems, including IBM's Integrated modems, have this capability. A new program that will monitor an IFS folder for TIFF images has been added. KeyesFax will automatically upload, convert and fax any TIFF images that are placed in the folder. This will allow PC applications to quickly send faxes by simply placing a TIFF image in the IFS folder. The KeyesFax.ImageMaker print driver can be used to convert any other type of PC document to a TIFF image for this purpose. KeyesMonitor can be used to automatically convert PDF documents to TIFF images, also for this purpose. The name of the TIFF image will be scanned for the Fax #, User-id, & Attention to values. V6R1 has allowed us to add "Job System Name" and "Creation Date" parameters to the spooled file selection criteria. We select *ANY System and the *LAST creation dates by default. Spooled file numbers have been expanded from a maximum of 5 to 6 digits. When working with faxes in the Fax Queue, a new filter will allow you to view *ALL faxes, "Not Sent" faxes, or faxes that have a "Sent?" status. The Export Fax feature will convert any inbound or outbound fax image to either a PDF document or a TIFF image and copy the result into the IFS. A new Job Queue (FaxComX) has been added to the FAXCOM subsystem. This new job queue will be used to run fax purges so that these long running processes do not interrupt other jobs on your system. KeyesFax ImageMaker Print Driver has been updated to work with Windows 7. KeyesFax has added DID fax routing to its extensive list of features. DID fax routing assigns a unique fax number for each user or device (such as a printer). Senders simply dial a typical phone number. KeyesFax automatically routes the incoming fax to its destination. With DID routing, faxes can be auto routed to users via e-mail, if KeyesMail is also installed on the system. Compiled all programs to be IBM i 6.1 compatible. Imaging software will quite often use Group 4 compression, for its efficiency in compressing many types of documents. A new program has been added that can convert TIFF images with Group 4 compression, into Fax images for faxing. Inbound faxes that are converted to PDF documents to be e-mailed must be repaired. Adobe's Version 7 PDF reader will not display any fax image that has flaws in them. Flaws are common for inbound faxes, because of noise introduced by the telephone system. A new program has been added to correct any errors in fax images before they are converted to PDF documents. The default Fax Security will only allow a user that has *SECADM special authority to access *ALL users in the Fax Queue. A new feature has been added that will allow a security administrator to add up to 10 other users to a list so that they can also access the *ALL Fax Queue entries. Spooled files that have been created with "Open DBCS" (Double Byte Character Set) fields can now be processed and converted to Fax images. However, any bracketed DBCS fields that exist in the data stream will not be converted to the appropriate graphics characters. This new server will allow users to display and control faxes, in their Fax Queue and Receive Queue, from their PC's using any web browser. The HTTP Server replaces the original PC Image Viewer, giving a PC user much more flexibility and capability to create, send and view their fax documents. Using any web browser a user will still be able to send documents from any PC application. They will also be able to track and control their faxes through the system. Along with a dialing prefix, you may now enter a dialing suffix in the Fax Setup parameters. The suffix is added after the end of the telephone number. It can be used to add access codes for each fax call. A new parameter has been added to the system called Consolidation Delay. This 2 digit value can be used to help the system consolidate multiple documents to the same recipient. To use it you would enter the number of minutes that the system should wait for additional documents to be added to the first page of a series. Newer PC operating systems no longer support the Shared Folder system. All programs that used to access the Shared Folders for temporary storage have been altered to use the IFS, instead. The Euro character was added to all of the available fonts. The Euro will take the place of the original generic money symbol. New code was added to prevent the system from accidentally dialing emergency calls for fax numbers. The system looks at the first few digits of each phone number and stops any job from dialing 911. Support for Hardware (RTS/CTS) Flow Control has been added for sending and receiving faxes. The previous version used Software Flow Control. Support for Class 2.0 Fax communication has been added. Some Hayes compatible modems (like US Robotics modems) have both Class 1 and Class 2.0 faxing capability. Others have just one class or the other. The Class 2.0 specification has proven to be more reliable than the Class 1 specification. Switching to Class 2.0 faxing may give you fewer "lost connections". Please note: You must check the modem specifications carefully. Class 2.0 is not the same as Class 2. Class 2 is a non-standard proprietary fax specification. Class 2.0 is a defined standard specification that we can use. Spooled files may now be defined to the KeyesFax system on a Spooled File Description screen. You can define faxing parameters to be used for the entire spooled file, or individual pages of a multi-recipient spooled file. Data can be extracted from the spooled file pages and used as the faxing parameters. Fields can be passed to an Exit program to extract additional information from any data base file. Up to 3 e-mail addresses can be specified along with a fax number for e-mailing some or all of the documents that you are faxing. The Subject, a Template, and the From Address can also be coded in your spooled file pages. New printer commands have been added to allow selective printing of all, failed, or sent faxes. Coversheets can be included with any spooled file, including multi-recipient spooled files. KeyesFax will burst the spooled files and add a coversheet to each piece. The From and To fields on the coversheet have been expanded to allow up to 30 characters for the recipient information and up to 35 characters for each of the sender's fields. Up to 76 characters of special Notes may be included on a each coversheet. The Notes are printed just before the regular Message lines. 2) Default Paper Length; Defines how long to make each fax page when printing to or converting from PCL. 3) Default Consolidation; Defines whether or not you want the faxes to be call consolidated. Support for the IBM 2771 and 2805 Integrated Modems has been added. These internal modems can be double used for both faxing and ECS. A correction to the program that converts AFPDS spooled files into FAX, TIFF, or PDF images has been made. Converted AFPDS spooled files had been prepared as 8 inch wide images. This caused some documents to lose up to 1/8 inch off the right side of the page. The new program has been altered to prevent any further clipping. KeyesFax can now send its documents to e-mail addresses. If you supply an e-mail address, in place of a phone number, it will convert the Fax image to an e-mail attachment. The attachment can be sent as either a TIFF image or as a PDF document, then mailed. The e-mail can be sent to any available mail server on your network, or it can even dial up an ISP. A new command ¬Email can now be specified within your spooled data in place of a Fax number command ¬Fax #. Each page of your spooled files can be either faxed or e-mailed depending on whether you supplied a Fax number or an E-mail address for that page. New options for sending your faxes to an e-mail address have been added to both the Work with Receive Queue and the Work with Fax Queue programs. New options have been added to the Work with Receive Queue program to allow you to save, rename, combine, edit, and keep track of images and forms overlays. Commands for specifying a Description, an Attention To name, and an E-mail address can now be specified in the User Defined Data field of the Spooled File Attributes. The security program for KeyesFax has been enhanced to allow specific authorities to be granted to users based on their Group Profiles. The Purge Fax Queue command has been enhanced to allow you to specify that *ALL faxes are purged from a Queue, instead of just those that have been completed. The Work with Fax Queue has been enhanced to allow you to view your faxes in descending order by the date and time they were created. This positions the newest faxes on top, instead of the bottom of the Queue. Also you can easily change the order so that the Queue lists your faxes by Document name or by Phone number. The Work with Receive Queue has also been enhanced to show you your faxes in descending order by the date and time that they arrive. This positions the newest faxes on top, instead of at the bottom of the Queue. You can easily change the order of the received faxes so that they are listed by Document name, by File name, or by Status. E-mail addresses are allowed in PBXFile member lists. This allows you to send a Fax document to a list of both fax numbers and e-mail addresses. A new method of connecting the Image Viewer has been added, called the PC Server. If your PC's are connected using TCP/IP, the PC Server connection is much easier to use than Shared Folders. The command to purge the Fax Queue has been enhanced to allow you to specify *LASTWEEK or *LASTMONTH for the period ending date. A new command to automatically purge the Receive Queue, by date, has also been added. This can be run interactively or in batch mode. Tools for creating forms overlays have been enhanced to make it very easy to create, replace, and adjust images that can be used as attachments or overlays. A new option has been added to the Work with Fax Queue program allowing you to instantly save any fax as an attachment or an overlay. Phone number collisions have been eliminated for multi-line systems. When you try to fax to the same number on multiple fax lines, the second call would get a busy signal. Now, the KeyesFax system will automatically detect the same phone number and make sure that it is not called until the previous fax has completed. A number of enhancements have been added to the Windows Image Viewer making it even more powerful and convenient to use. It now has auto-printing capability, to allow IBM i (i5, iSeries, AS/400) applications to print faxes directly to PC printers using any PC that is running the Image Viewer. It also has the ability to auto-convert fax images to other types of images, then save these to any device available to your PC. Faxing multi-recipient spooled files has been enhanced to be faster and more efficient. Prior to version 7.0, spooled files with multiple recipients would be completely converted to Fax images before the system would break them up into the various recipients. Now, the system will break up the spooled files into individual jobs before the conversion is started. This allows the system to start faxing to the first recipient as soon as it is finished its conversion. The call consolidation program first introduced with version 6.0 has been enhanced. It can now consolidate multi-page spooled files that have multiple recipients. You no longer need a PC to view spooled file images from the Fax Queue. The original spooled file data can now be viewed, using any type of 5250 terminal. Landscape faxing has been enhanced. The record length of your printer data, being faxed in landscape mode, is now checked. An appropriate font will be automatically selected that will print all the characters on the fax page. A local calling area file has been added to the KeyesFax system. If you supply the file with your local calling information, the system will automatically determine whether phone numbers are local or long distant and dial them correctly. You need only supply the fax number with an optional area code and the system will add a (1) or strip off the area code, as appropriate. The system will automatically consolidate faxes that go to the same recipient into one call when all the faxing parameters match (priority, scheduled time, etc.). The Work with Receive Queue program will accept user definable options. An option to print Fax images as well as user definable options have been added to the Work with Fax Queue program. The first page's Page Description will be placed in the Description field to make it easier to identify your faxes. You may set the system to automatically purge faxes as soon as they have been sent. You can also have the system automatically purge failed faxes, if desired. A new command to purge the Fax Queue, by date, interactively or in batch mode has been added. A number of enhancements have been added to the Windows Image Viewer making it faster and more convenient to work with images on both the IBM i (i5, iSeries, AS/400) and the PC. New functions to Despeckle and to Print the images are available. A new method of connecting the Windows Image Viewer to the IBM i (i5, iSeries, AS/400) has been added. You may connect to the IBM i (i5, iSeries, AS/400) using either Data Queue support or Shared Folder support. Many new features have been added to the Message Editor including automatic word wrapping, a spell checker, and a phone book lookup function using the Information Manager. A new command has been added that you can use to quickly and easily create phone list members in PBXFILE using the Information Manager. The Fax Setup command will allow you to set the Run Priority of fax conversions. A new feature will allow you to send fax coversheets interactively or in batch mode, without any operator intervention. Ten new scalable fonts have been added to the system. You can scale the new fonts from 4 to 99 point in size and completely adjust the character widths on any IBM i (i5, iSeries, AS/400) Fax. Fax commands, that you code in Spool Files, have been enhanced to allow multiple commands on each print line. A new function will also allow you to specify that the rest of the print line that contained the Fax command(s) be removed or left in the converted Fax. ¬Attn (attention to name), ¬Font (controls the scalable fonts), ¬Space (adds white space to a page). A convenient way to adjust the text in your spool files, especially when they are merged with forms overlays, has been added using Offset down and Offset across parameters. All of the faxing commands have been enhanced to accept a Scheduled Time and Date that you want the fax to be sent. AFPDS printer files can be translated into FAX images by the system. Page numbers have been added to the top of each fax sent. The system has been made Year 2000 ready. A new program has been added that can be used by each operator to track and control their own faxes. Every fax is automatically entered into a fax queue where the users can watch the activity as each fax is converted, scheduled, and transmitted. The users will have complete control over their own faxes. They may change the fax parameters at any time, such as what line to use, which pages to send, the priority, or the phone number. They may also hold or cancel faxes, restart them, delete the sent faxes, reschedule them or view them, if desired. A new program has been added that can be used to control inbound faxing in a fully paperless environment. Operators can easily copy or route received faxes to one or more other recipients or files. They can combine faxes together, break them up, refax them with an optional coversheet, view the faxes, print all or selected pages, and type up notes for each page all from the Receive Queue. To help them keep track of their faxes they can be routed to different files and the status of each fax can be set by their owners to New, Current, or Archived. Normally users can only access and control their own faxes. However, users can easily give one or more other users temporary access to their faxes to assist them while they are away. Security administrators will have complete access to the fax system. A new Windows program that works like a printer driver on your PC has been added. The fax capture driver will allow any Windows application to quickly and easily send a fax with an optional coversheet through the IBM i (i5, iSeries, AS/400). The coversheets can include your company letterhead, logo, signatures, etc. The driver uses IBM's Enhanced Data Queue support to quickly upload the faxes to the IBM i (i5, iSeries, AS/400). This support is included with IBM's PC Support/400 and Client Access/400, as well as Wall Data's Rumba and NetSoft's Elite/400 emulation products. The Windows image viewer no longer needs the Enhanced High Level Language Application Program Interface (EHLLAPI) to function. It now only requires the use of IBM's Enhanced Data Queue support to quickly download images to your PC's for viewing. FAX image members in OUTFILE are now automatically purged from the system as operators delete the Sent faxes from their Fax Queue. A new program has been added that allows you to easily control and track all fax activities. You no longer have to use WRKACTJOB to find out what the system is doing. Each fax line's current activity is clearly shown to you on the screen. You can actually watch the system as it dials, connects, and then sends each page. This versatile program will allow you to start, stop, or cancel fax communication, and change the setup for any fax line. It will also allow you to access all of the resources for the fax system, such as job queues, message queues, spool queues, active jobs, and all image files. A new method of supplying fax phone numbers for printer output has been added. If the phone number is printed somewhere on a document, you can supply the location of the phone number in the User Data field of the Spool File Attributes or on the Fax Spool File command. The system will look in the designated area on each page of the spool file and fax the documents accordingly. You can specify the location of a customer or vendor number on your documents, and the system can look for the fax numbers in your master file. This can allow you to successfully fax spool files even when you do not have access to the application. PCL5 printer files from the IBM i (i5, iSeries, AS/400) or PC's can be translated into FAX images by the system. The PCL5 printer files can contain HP GL/2 vector graphics, pie charts, line drawings (with rounded corners), scalable fonts, shading patterns, etc. This will allow companies that are using Forms Design packages to convert their printer forms to forms overlays for faxing. A new parameter has been added to the SNDFAX and FAXSPLF programs which you can use to identify the recipient at the top of each fax page without the need of a coversheet. Start & Ending Page Numbers: The Starting Page and Ending Page Spool File attributes can be set to designate which pages of a FAXCOM spool file you wish to be faxed. Spool File Record Length: The Record Length of a Spool file is now checked. For record lengths greater than 80, the font will be automatically adjusted so that the entire page will fit on the fax. The Starting Page and Ending Page Spool File attributes can be set to designate which pages of a FAXCOM spool file you wish to be faxed. The Record Length of a Spool file is now checked. For record lengths greater than 80, the font will be automatically adjusted so that the entire page will fit on the fax. Each received fax can be routed to any printer, file, message queue, or OfficeVision mail box that you designate. You can base the routing on the sender's phone number. The Remove after faxing parameter has been enhanced for the Fax Spool File command. You can now specify that the spool file is only removed after a successful transmission. This allows you to print faxes that failed to transmit. A new parameter was added to the Print Image command to allow you to specify that more than one copy should be printed of a fax. Two new image viewers have been added which allow you to display images using IBM's new 3489 Image/Fax terminals or on PC's using Wall Data's RUMBA or NetSoft's ELITE/400 programs. This Windows image viewer uses the Enhanced APPC router, EHLLAPI, and Enhanced Data Queue support to quickly display images in a resizable window. A text editor has been added that you can use to create quick fax messages or coversheets with your company logo using any IBM i (i5, iSeries, AS/400) terminal. Attachments, such as brochures, price sheets or spool files, are easily included with your messages. Your applications can pass full recipient information to the editor to reduce operator workload. The system can now use from 1 to 8 fax lines. Each line can be set up separately using FAXSETUP for either send or receive or both. Each fax can be assigned a scheduling priority to determine the order in which the jobs are selected for conversion and transmission. Each fax can be assigned a different number of failed transmission retries or you can accept the default value that is assigned using FAXSETUP for each line. The system will instantly recover from interrupted transmissions and will automatically restart them after the last good page sent, without using one of the retries. Fax completion messages can be routed to any message queue desired. Also, every fax is logged into one of two new log files that you can use as proof of delivery or for retransmissions. SENTFILE will contain an entry for each fax successfully transmitted and FAILFILE will contain an entry for each fax that failed after all retries were exhausted. You may assign a Fax Operator for each line who will receive important messages about the operation of the fax system. These messages will include: Inbound fax received, the ending of fax communications, and the failure of a communication line. You may define and use Distribution Lists and Directories for broadcast faxing with full substitution field capabilities. New ¬Fax commands allow you to name either a Distribution List or a PBXFILE member within a document for faxing to multiple recipients. Fax accounting codes may be assigned to individual users and/or jobs to track fax resources. The codes and the connect seconds are logged in the Fax History Log file. You will have much more control over spool files placed in our FAXCOM output queue. The phone number can still be coded in the User data field of the spool file. The width of the print line can be assigned in the Forms type field for spool files wider than 80 characters or you may enter 'LANDSCAPE' to fax the spool file sideways. The system will use the spool file's Output priority as the Fax job priority and will use the Accounting code field in the Fax History Log. The Save file after printing field determines whether or not the spool file will be deleted or placed on HOLD. You may merge a form with the spool file by coding the name of your form in the Front side overlay field. You can easily add a cover sheet using OfficeVision or any other word processor to one or more Print keys or any other spool files. Not only can you cut, paste, merge, and flip over any image, you may now scale images to any size or reverse the colors to assist you in making forms overlays. Any PC attached to the IBM i (i5, iSeries, AS/400) will be able to send a fax from any PC word processing or graphics program. You may fax your documents using Virtual Printer support if you have PC Support on your IBM i (i5, iSeries, AS/400). If not, you may upload your PC printer files using our FAXIMG cooperative processing program. Inbound faxes may now be printed using the faster PCL5 language on any HP compatible Laserjet printer with this capability. This will speed fax printing considerably.